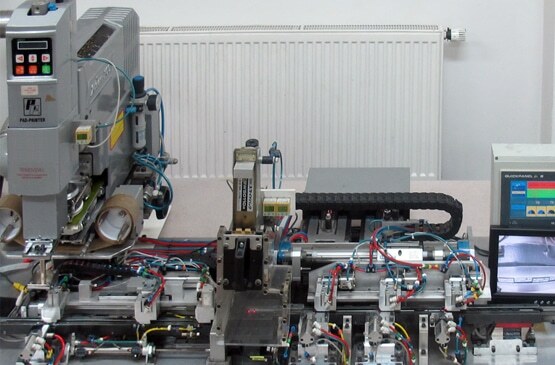 Due to the unique nature of our relays, much of our production machinery is designed and manufactured by our engineering staff. Above is part of the production equipment used in the manufacture of our popular Series 109P Single-in-Line relay. This is the finishing stage in the production of the popular Series 109P relay. The relay enters this stage from the right. The unwanted part of the leadframe (the salvage bar) is removed leaving the connection pins of the relay at the finished length. The relay is then removed from the salvage plastic part and moves on to have the part number, date code and Pickering name printed on the top face. The finished part exits this stage and is passed to our Test Department for thermal cycling and Final Test. We do not sample test. All Pickering relays are tested for every operating parameter. 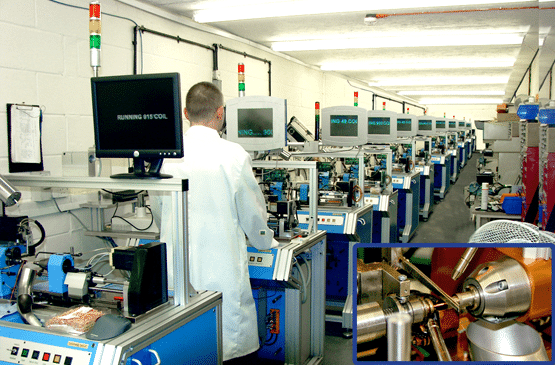 Most Pickering reed relays are constructed using 'formerless' coils wound on 'state-of-the-art', precision automatic winding machines. An adhesive on the coil wire, is melted under high temperature during the winding process to form a solid 'self supporting' coil assembly. This technique dispenses with the extra thickness required by a coil bobbin and allows Pickering to manufacture the smallest and most sensitive reed relays that are available today.